White Doves represent Peace, Love, Faith and Fidelity. Are you planning a special occasion, in East Anglia? Wedding, Birthday, Vow renewal, Memorial, Civil Partnership etc. We are here to make every occasion extra special with our White Dove Releases. 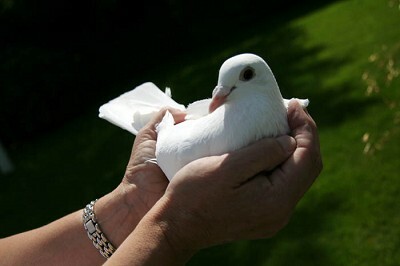 What better symbol than beautiful White Doves being released, to bond hearts and souls? Whether you are uniting new love, saying a fond farewell to a loved one or celebrating something special, the flight of our Doves will lift your spirits. Every White Dove Release, leaves you with an amazing and everlasting memory of any occasion.